HOW IT WORKS: When your purchase is complete, you will receive a receipt and a Gift Membership certificate by email. If you check the "Email to Recipient" box below, your gift recipient will also receive a copy of the Gift Membership certificate by email. Share the certificate with your gift recipient. It will contain instructions on how to activate the Gift Membership. 1. Choose the gift membership level from the drop-down menu below. 2. Click “Enter Gift Recipient Information” and follow instructions on the pop-up. 3. Click "Save," then click the “Next" button. 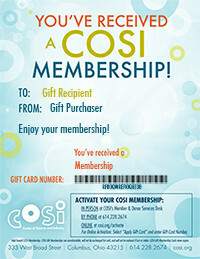 *COSI gift card sales and redemptions are not considered tax deductible contributions to COSI.